Happy Pi Day! 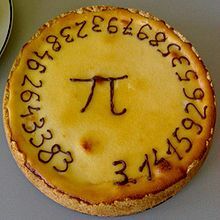 As you have undoubtedly noticed thanks to pictures and references to the culinary type of pie in your social media streams, tomorrow is March 14, or 3.14 the (rounded) mathematical constant representing the ratio of a circle’s circumference to its diameter. But wait, there’s more! Not only is tomorrow 3.14, it’s 3.14.15, which is even more auspicious, as the next two decimals after 3.14 in the ratio are “15”. A once in a lifetime event for mathematical nerds for sure. This got us thinking though, was there ever an even crazier (relatively speaking) celebration possible? What about 3/14/1592? First, was pi even a “thing” in 1592? That one is easy – Yes. The earliest approximations of pi date to Egyptian times (though the actual figure was not as accurate in Egyptian times so Egyptians may have been celebrating on a different day). Second, was pi 3.141592 in 1592? The answer again – yes. Though more of a meandering yes. Around 480 AD, a Chinese mathematician correctly calculated the first 7 decimals, which would be cause for celebration nearly 1100 years later in 1592, but others after him actually calculated it less accurately. Around the 15th century, the calculations switched from a geometrical technique to infinite series techniques which allowed pi to be computed with a lot greater precision. Long story short, 3.141592 was “real” in 1592. But what about pi itself. Was it called pi in 1592? Because without pi, we would have no pi day. The answer – no. While pi as a mathematical constant had been around for centuries, it wasn’t actually represented by the pi symbol until the early 1700s. In reality, without social media to spread the pi love, probably no one outside a small group of mathematicians would have ever celebrated. But now it’s a “thing.” So tomorrow, celebrate pi and eat some too. Reference: History of Pi on Wikipedia.